We have come to the end of our journey, created memories that will be with us for years to come. By the many photos taken these memories will be even clearer. We went from Füssen, to Riva Garda, Mayrhofen, Erding and tomorrow to Münich Airport and home. I’m certain everyone will agree that the trip was a success without many mishaps or missteps other than a few sore throats, sniffles and coughs. The success of the trip was primarily due to the fastidious planning and cooperation of all fellow travellers. The hotels were great in all locations. Some choir members had bonus enjoyment in meeting friends and relatives along the way. Shopping was excellent, a chance to purchase items not available in Canada or gifts for those back home. - Visiting the mountain top dam at Zillergrund near Mayrhoffen. 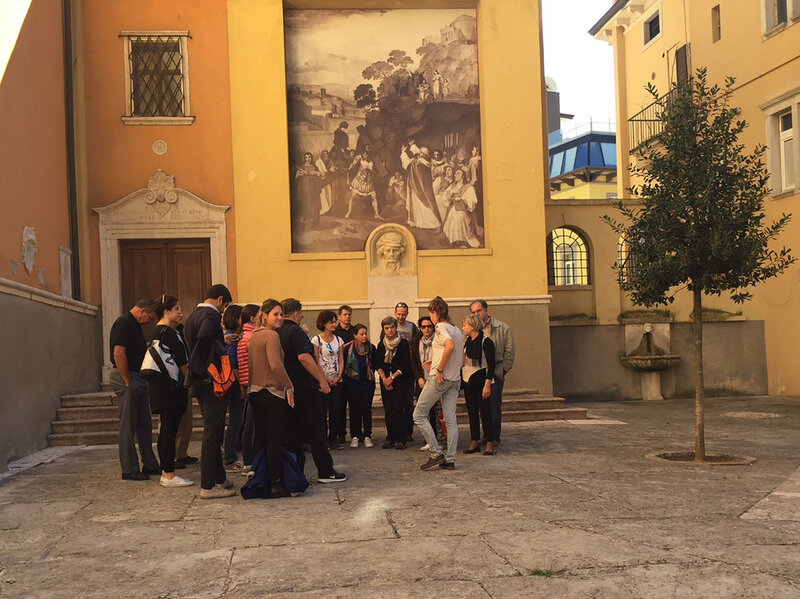 The highlight of the trip, I’m sure we can all agree, was the festival In…..Canto sul Garda. And the icing on the cake was winning the Gold in our category. This will be long remembered after all the other details of the trip fade into the past. Though we won Gold in our category, the real victory was to share the stage with many great choirs from around the world. 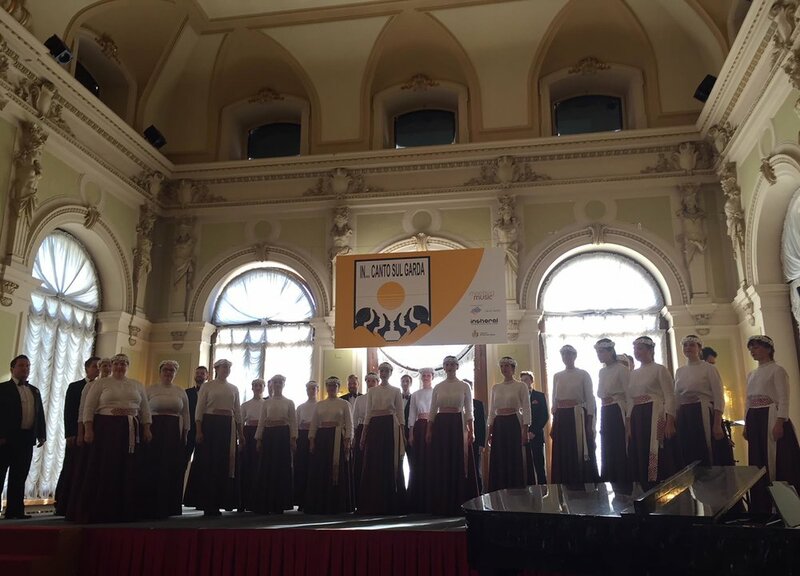 Just to hear them and inspired by their choral excellence was the victory for me. Firstly, Kemo, our bus driver who chauffeured us safely and comfortably to all locations, some of them being very tight going on steep mountain roads. Thank-you Kemo. Our porters, Andrew, Travis, Oswald and Gene did the heaving lifting to make our moves from location to location, smooth and effortless. Many thanks. Jennifer played piano for us throughout the trip and in Füssen as we prepared for the festival. The practice set-up in Füssen wasn’t ideal as she played in a remote alcove, far from the choir. Somehow, she made it work. Thank you, Jennifer. Donalee, for her diligent and patient efforts in preparing our choir to heights we never dreamed possible. She had the vision and instilled confidence in us. All we had to do was what she told us, and we would get results. And, the proof was in our scores along with a Gold performance. Thank-you, Donalee. And finally, the trip planning committee – Frank, Odo, Andrew, Len and Wilf. Planning such a trip is no small matter. They made every effort to ensure our convenience, comfort & safety, in addition to arranging a number of sensational side trips. Many thanks to the committee. Above all, Wilf our tour leader who gave us a step-by-step narrative of what was before us. Over the course of the trip, I’m certain he responded to questions of when, where and why ‘a hundred times or more’. His patience with us was remarkable. Throughout the trip he demonstrated his strong leadership but none more on the night we went to the Friendship Concert in Ala, an feudal town in the foothills of the Alps. The night we drove out of Riva del Garda to the concert, we encountered a Stau (traffic jam) which was going to make us late for the concert. He kept our spirits up by saying, ‘no worries, we’ll get there.’ Then in Ala, we got to a street that was too narrow for the bus to go forward. Wilf jumped out and ran ahead on foot to find our destination. Soon a pilot car showed up and took us to the town square, our destination. Even here, we were not certain we had reached our convert venue. Wilf searched the square until he found a poster indicating that this was, in fact, our destination. Finally we were able to get into the church, Chieso San Giovanni, and sang to it’s amazing acoustics. We, also, were able to listen to a youth choir from the Check Republic on this enchanted evening of choral music. Had it not been for Wilf’s determined leadership, we may have missed this opportunity, completely. Thank-you Wilf and thank you Karen for sharing your husband with us. We will return to our lives and singing back in Edmonton, richer for our European Tour 2017. 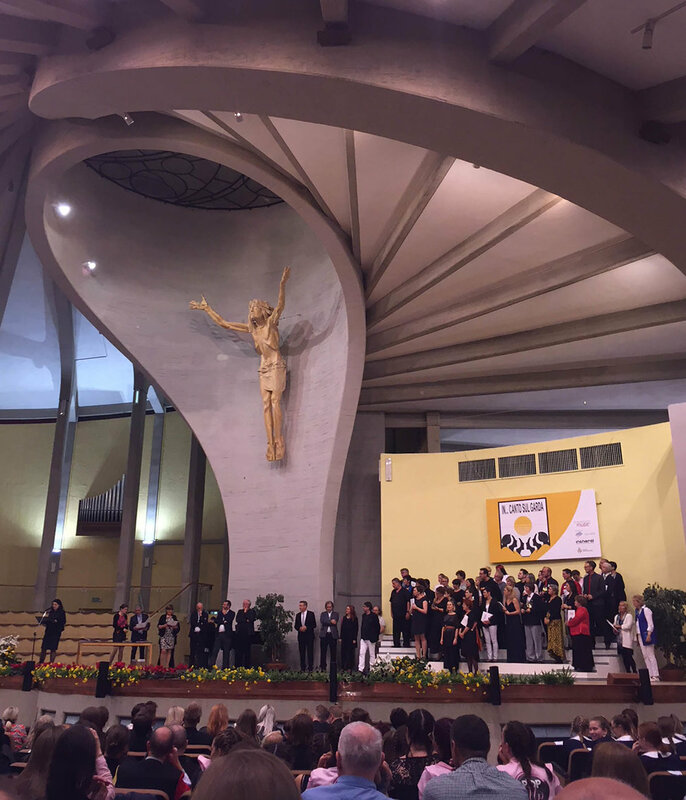 Inspired by this experience, we sill strive to reach for higher ground in our choral efforts.